Services: branding, photo shoot direction, web design. “We stumbled upon Curious Design’s website at the time we were re branding our business. We reviewed the work they had done and we thought that they were able to create unique logos and websites for businesses. We explained our project and the ideas we wanted to transmit to our clients. Curious who were able to put our words into images. We worked together but, although they always asked for our opinion, we asked for guidance and often decided to go with what they though would work best for us. We trusted their advice and we are so glad we did. The result was very strong and elegant branding that had direct impact on our sales and position in the industry. The investment was worth it as it brought immediate sales and it meant a “jump” for our business. 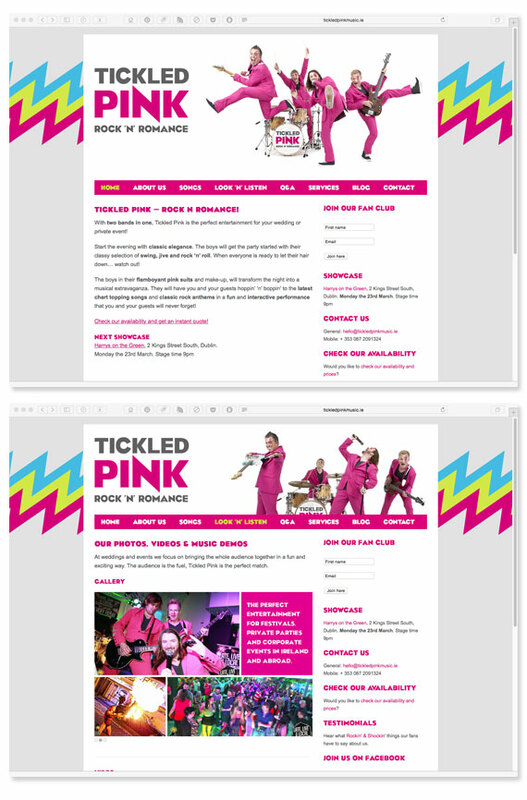 Tickled Pink are 2 wedding bands in one – performing classic swing, jive and rock ‘n’ roll and contemporary rock and pop hits. We developed a modern logo and brand for the band, art directed a photo shoot and designed and developed their new website which features an animated gif illustrating their transition from classic crooners to rock gods!